Inflation in Europe is building up, at an increased pace. This is not only seen in the HICP release, the European equivalent for the CPI, but in the PPI read too. The Flash estimate for May is up 3.6%, from one year ago, much higher then the ECB’s target of 2% over the medium term. The release is up from 3.3% one month earlier. The flash estimate can be considered a good proxy for the CPI read; it has anticipated exactly the inflation rate 15 times, with another 9 times differing by 0.1%, over the last two years. What is worse, this inflation is not only in statistics, because of the energy component, but it is felt in the food department and ultimately in the European consumer’s pocket. 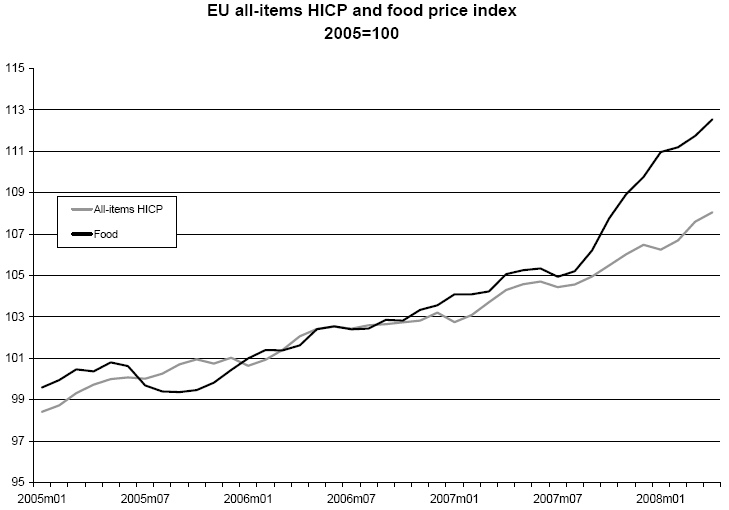 Food prices increased 7.1% from last year, over the same period in which the HICP read got to 3.6%. March and April marked the highest food inflation rate since 1996, when the series were created. Statistically speaking the HICP and food inflation moved “hand-in-hand”. Inflation rose 27% since 1999, while food inflation reached 31% over the same period of time. The biggest gains from the food department were recorded by milk, cheese and eggs, gaining 15% in a year, followed close by oil, fats, fruits, bread and cereals. Producers are not doing much better, the PPI release shows. The Index rose 6.1% from April last year. The trend had accelerated since September 2007, from a somewhat flat trend to a more temperate one. All this points out there is inflation in the Euro area, despite whatever policy members are saying. Inflation in Europe accelerated while the interest rates remained constant. Simple logic will tell us that leaving rates steady won’t bring down inflation. For me, the story that the global slowdown will bring inflation down doesn’t seem appropriate, we already had this situation in the 70s and it was called stagflation. Plus, a global slowdown requires lower interest rates, which leads to inflation. A Lose/Lose situation. My view is that the ECB wants to raise rates, but they say that they can’t right now, but watch for signals that they may have to act. The ECB looks caught between the hammer and the anvil, and will need some time to get out to a safer place. In other words, a “hold” is on the books, but we need to be ready with some Long numbers ahead of the ECB decision, the euro really has a lot of room to run topside if the Dollar Index cannot break 74.00 in the near-term. The euro valuations are already where Mr Bernanke yearns for the dollar to be.